Fig. 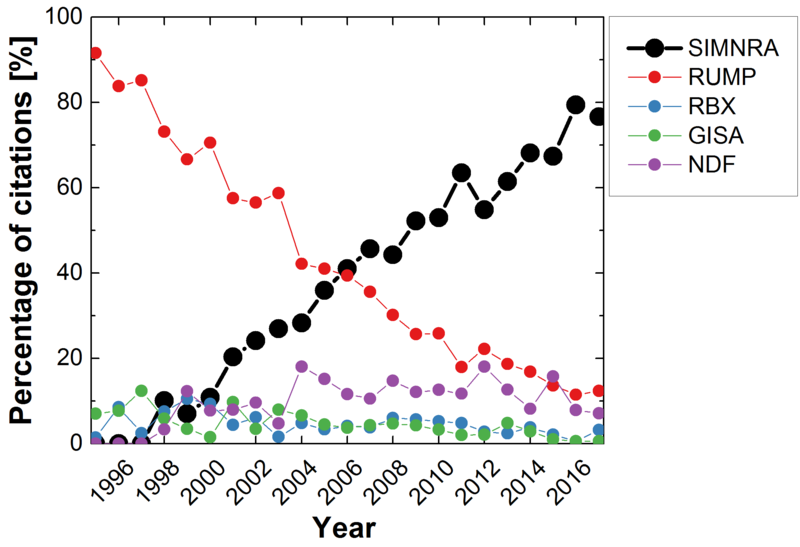 1: Number of citations of different ion beam analysis simulation programs from 1995 to 2017 in all Elsevier journals. The citation frequency of ion beam analysis simulation programs is an indication for their frequency of use. 70-80% of all ion beam analysis related publications are published in a journal edited by Elsevier Science. Fig. 1 shows the number of papers in all Elsevier journals, which cite at least one ion beam analysis simulation program. The method to determine the number of citations is described here. Proceedings of IBA conferences appear in even years, resulting in peaks of the citation frequency every two years. The total number of yearly citations increased from about 70 in 1995 to maxima of more than 200 in the years 2006 and 2014. 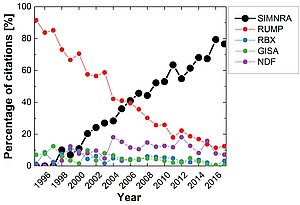 This shows the increased use of computer simulations in ion beam analysis, but also the general trend in all sciences to rising numbers of publications. Fig. 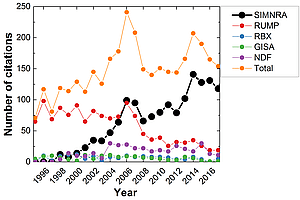 2: Percentage of citations of different ion beam analysis simulation programs from 1995 to 2017 in all Elsevier journals. 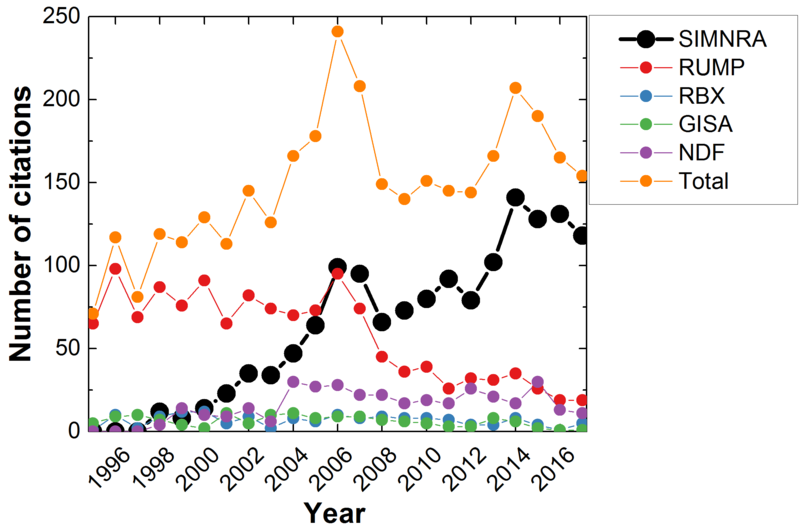 The percentage of citations of different ion beam analysis simulation programs in all Elsevier journals is shown in Fig. 2. Ion beam data analysis was dominated by the RUMP program in the mid-90's, when RUMP was used in more than 90% of all publications. SIMNRA and NDF were released in the late 90's, resulting in decreasing use of RUMP, constant use of RBX and GISA, and increasing use of SIMNRA and NDF. SIMNRA started to overtake RUMP in 2006 and was the most often cited program in the following years. Expert search at Elsevier Science. Journals published by different companies are not taken into account. Most program names are not specific enough: Searching for RUMP in the full text of articles will find also authors named Rump, the Rump matrix used in nuclear physics, and the like. Moreover, many articles don't mention the program name, but only a reference or a web site for the program. As a consequence it is necessary to search for the program name (if possible), or typical program references. The use of different search terms may give somewhat different results.